Acquire specialist product knowledge and commercial understanding for the major light wine producing regions. Split into 4 elements studied at different points during the course. Before registering for Unit # 3, you must have completed Unit # 2. It is also recommended that you take Unit # 1 prior to taking Unit #3. Each Element takes 7 weeks to complete. The entire Unit # 3 course requires 28 weeks. Intended for distance students where regular class attendance is not possible. 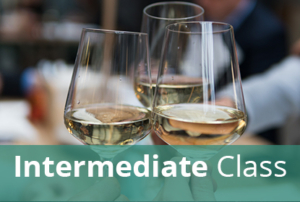 Includes online tuition – Elements 1,2,3,4 (28 weeks), Coursebook, 10 feedback theory test questions & 4 feedback tasting tests, full day tasting tutorial (at the Capital Wine School on Saturday, November 17 – 9:00am-12:00pm (Lunch not included), and the full day final exam on June 13, 2019. Students who have already passed the tasting portion and wish only to avail themselves of the online theory course and theory only exam on June 13, 2019 should choose the Unit #3: Light Wines of the World Theory Only option when registering.